Foam rollers are cylindrical things that use your body weight to massage your sore and tight muscles and can also give you a strength workout. 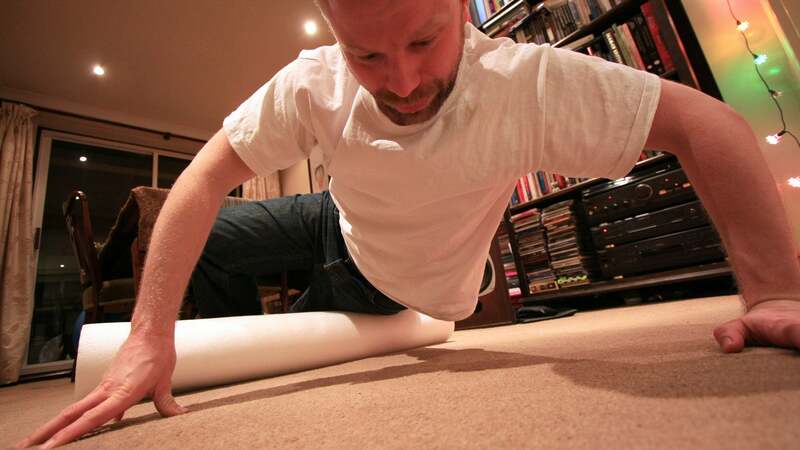 You can buy them from any sporting goods store, but today you'll learn how to easily make your own durable foam roller for less than $US20 ($26). Before you make this, we should warn you: This particular DIY foam roller is really, really firm because it's basically a wide polyvinyl chloride (PVC) pipe, a material that is often used in construction. So if you've never used a foam roller before, something as hard as a PVC pipe is going to feel excruciating (in a good way). A yoga mat or kitchen cabinet liner, as suggested here, can soften it up but only a teensy bit. If you're cool with that, all you need is the right length of PVC pipe; but if you choose to make it "softer", you need kitchen cabinet liner (or a yoga mat), a Stanley knife and some sort of adhesive like a spray or rubber cement as well. You'll find PVC pipes at your local hardware store. Choose the white rigid one that is at least 15cm in diameter and ask an employee to cut you a bit more than what you think you need. Most foam rollers are between 9 and 90cm long, but I'd recommend making this one about 30cm for versatility. If you plan to wrap the PVC pipe with liner, make sure the width of the liner is longer than the length of the PVC pipe, then simply glue and roll the PVC pipe like a sushi roll. For pictures and clearer instructions, check the article linked below which also goes into the finer points of foam rollers and how to use them.